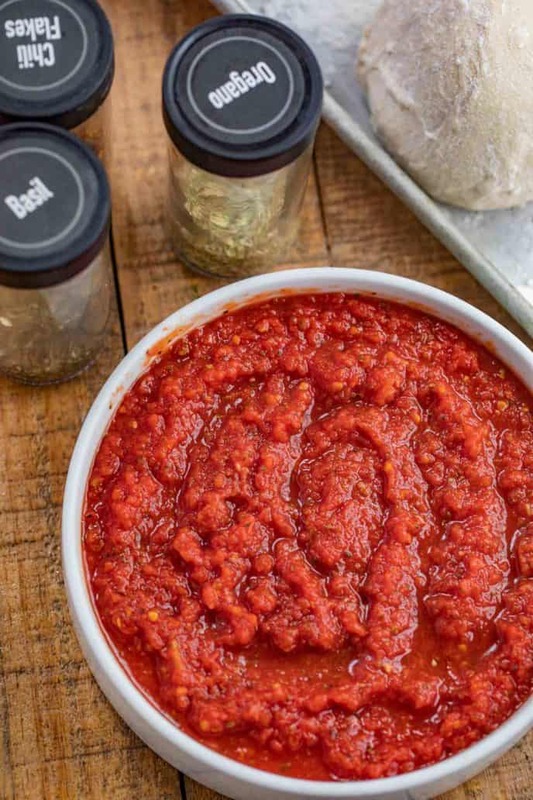 Easy Pizza Sauce is the PERFECT addition to your pizza, made with sautéed onion, tomatoes, olive oil, and seasoning, and ready in only 30 minutes! 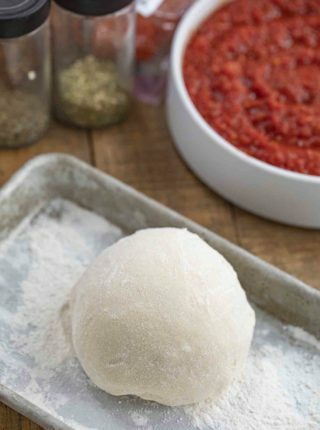 We love making homemade pizza sauce over store-bought any day, because it’s perfect for our Easy Pizza Dough, Pizza Sloppy Joes, and Tortilla Pepperoni Pizza! Easy Pizza Sauce is my all-time favorite pizza topping, made with whole tomatoes, onions, extra virgin olive oil, herbs, and spices. It’s insanely easy to make homemade pizza sauce, which is why I almost never buy store-bought sauce when we’re making homemade pizza. This sauce is quick and easy to make, taking a total time of 30 minutes and made with ingredients you probably have in your pantry already, plus it is naturally dairy free and gluten free! I like to always have this ready for pizza night, a single batch makes enough for 4-5 pizzas (depending on how saucy you like your pizzas! (so this is perfect for meal prepping too!). 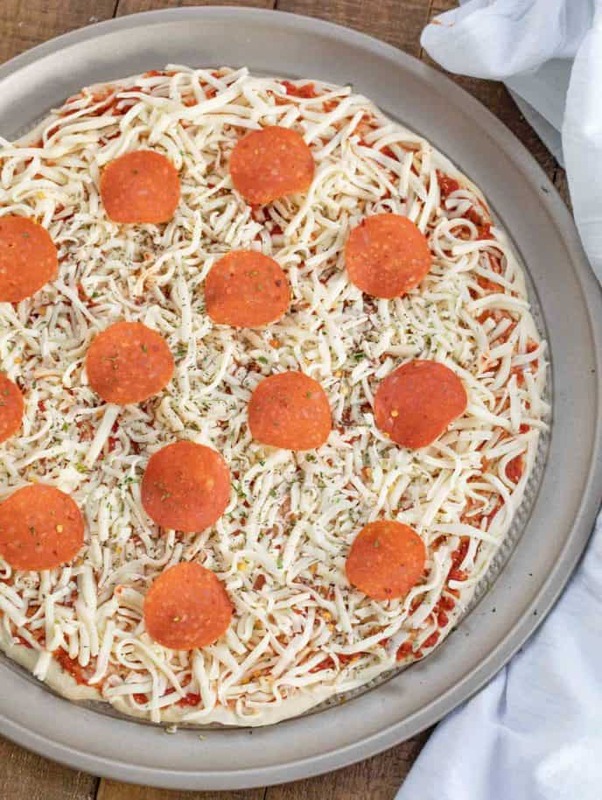 This goes perfectly with my homemade pizza dough along with your favorite toppings! Pizza sauce is thicker than spaghetti sauce, making it the ideal combination with bread and pizza crust because it won’t make it too wet. Pizza sauce also uses more herbs and seasoning for a more flavorful sauce. For the cooking method, you don’t have to cook the sauce as long as you would for marinara sauce. Some recipes don’t call for cooking at all, but I like the depth of flavor that the sautéed onions add to sauce. HOW LONG DOES PIZZA SAUCE KEEP? Homemade pizza sauce will last 4-5 days in the refrigerator, sealed in an airtight container. If you want this to last longer, you can freeze the sauce for up to 3 months. Wait for the sauce to completely cool before trying to freeze it. I usually freeze the sauce in ziplock bags, double-wrapped with tinfoil. WHAT TYPE OF TOMATOES DO YOU USE FOR HOMEMADE PIZZA SAUCE? 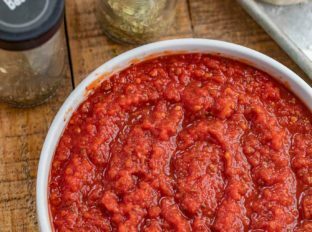 I make this pizza sauce recipe with canned tomatoes, because it’s something I always have in my pantry. I’ll use whole tomatoes in water, or crushed tomatoes. You can use fresh Roma tomatoes if you have them, but make sure you mash them or use a food processor or immersion blender to give them the texture of tomato sauce. You can thicken this pizza sauce using a small can of tomato paste, stirred into the sauce while it’s still hot. Add other veggies into the sauce with the onions, like bell peppers or mushrooms. 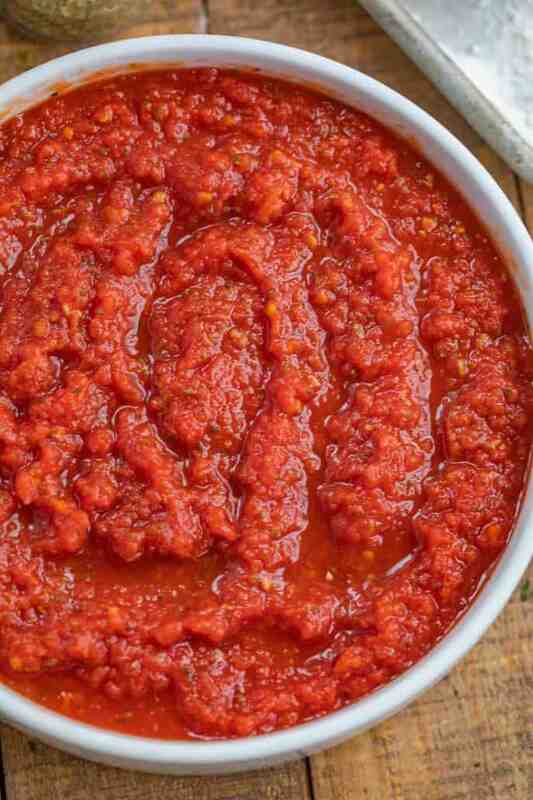 Make this pizza sauce spicy with extra pepper flakes or a dash of cayenne pepper or black pepper. 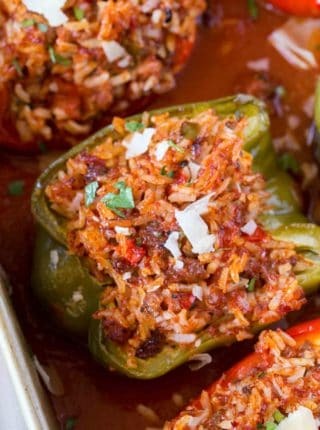 You can substitute the whole tomatoes with canned diced tomatoes or fresh tomatoes in this sauce, and the garlic cloves with 1 teaspoon of garlic powder. If you’re in a rush, you can make a no-cook version of this pizza sauce and puree it in a blender or food processor instead. You can sub the seasoning in this sauce with Italian seasoning if that’s what you have, or fresh basil and oregano. The granulated sugar in this sauce balances out any bitterness you may get from the ingredients, so don’t skip this one! You can substitute with brown sugar for a deeper flavor in this recipe. 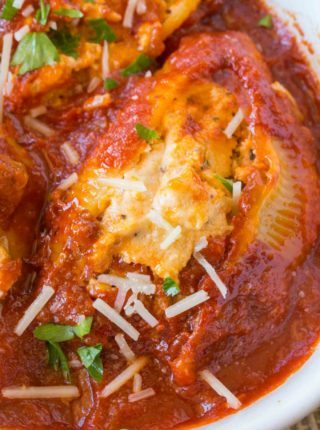 Add a tablespoon or two of parmesan cheese to the tomato sauce for extra flavor or if you have any rinds left over you can cook the rind with the pizza sauce for a ton of flavor. In a large dutch oven add the olive oil and onions and cook on medium heat for 4-5 minutes, stirring frequently. 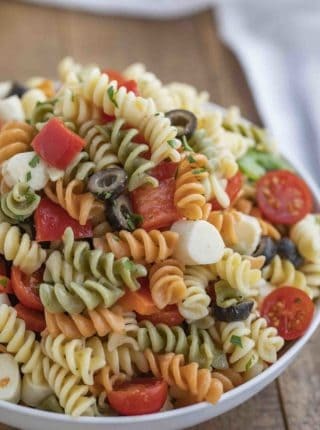 Add in the oregano, basil, red pepper flakes, sugar, salt, garlic and tomatoes and stir well and cook for 5 minutes then using a potato masher mash the tomatoes into a chunky texture, lower the heat to medium-low and let cook for an additional 15 minutes until the consistency is very chunky. I had almost given up on all the pizza sauce recipes out there. So I decided to give this one a try and I’m done looking. This one was what I had been looking for, sooo good, even the hubby gave it a thumbs up! I used diced tomatoes as a change and used Italian seasoning. This recipe is so good I’m making pizza tonight. You finally helped me to nail down pizza sauce. Thank you so much!! Woohoo! I’m so glad you love it so much! I have just made it. The taste is so good that I decide to make the pizza for tomorrow breakfast. I know my kids will love it. The tips was very useful to me! Thanks so much for this great pizza sauce, Sabrina! I’m so glad you enjoyed it, Ethel! Pizza for breakfast sounds like a winning idea!